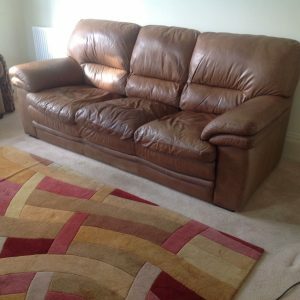 A three seater high back sofa upholstered in chocolate brown faux leather, together with a large weave patterned woollen area rug. 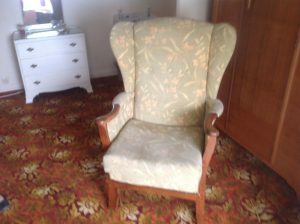 A vintage solid wood wingback fireside armchair, upholstered in floral patterned fabric. 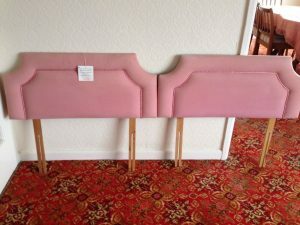 A pair of vintage single headboards upholstered in pink fabric. 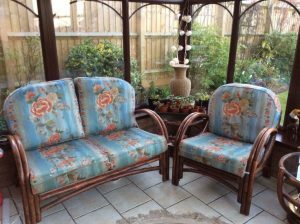 A three piece cane conservatory sofa suite, to include a two seater high back sofa, an armchair and a glass topped side table. 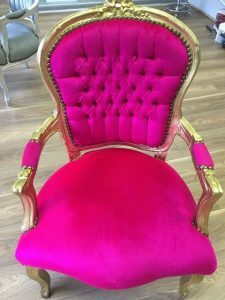 A hand painted gold heavily carved solid wood armchair, upholstered to the seat, backrest and armrests in fuchsia satin. 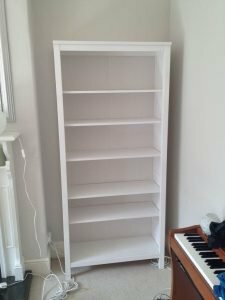 A tall standing white solid wood five shelf bookcase. 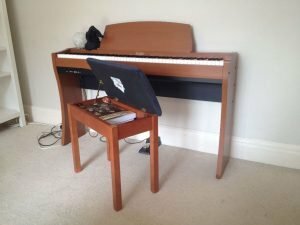 A Kawai rosewood digital piano and matching storage stool. 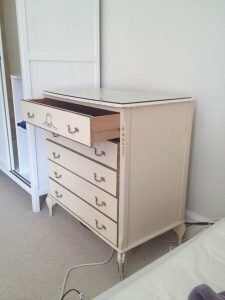 A hand painted cream solid wood glass topped chest of drawers, having five drawers with brass handles. 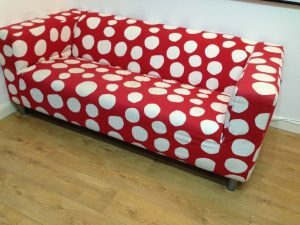 A three seater low back contemporary sofa on chrome legs, upholstered in red and white polka dot fabric. 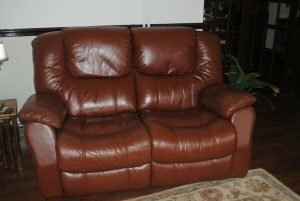 A two seater high back reclining sofa, upholstered in chocolate brown faux leather. 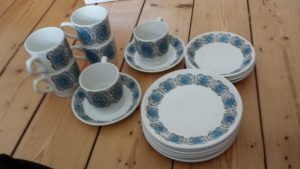 A set of retro blue floral patterned kitchen ware, to include six teacups, six saucers and six side plates. 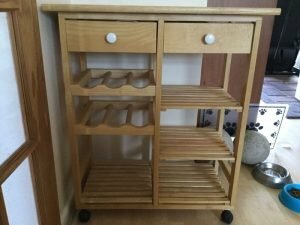 A tall standing solid pine butchers block on castors, having two drawers above two wine racks and four shelves. 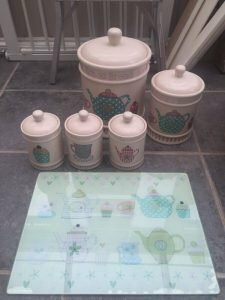 A collection of teapot patterned shabby chic kitchen accessories, to include a glass chopping board, a large bread bin, a cookie jar and tea, coffee and sugar canisters. 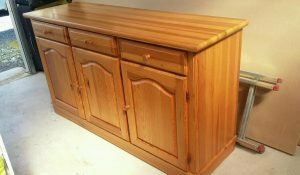 A large solid pine rectangular sideboard, having three drawers above a double and single cupboard. 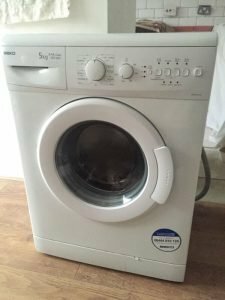 A white Beko 5kg 1200 spine under counter washing machine. 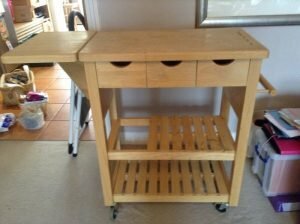 A solid pine tall butchers block on castors, having three drawers above two shelves. 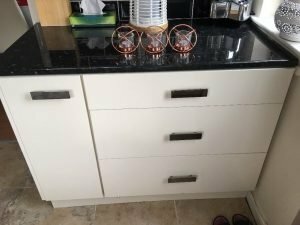 A white marble topped high gloss kitchen unit, having three large drawers aside a cupboard. 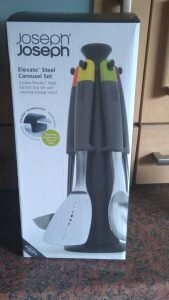 A brand new boxed Joseph Joseph elevate steel carousel utensil set. 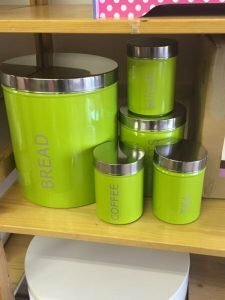 A set of lime green and stainless steel cylindrical kitchen canisters, to include a large bread bin, a biscuit jar and tea, coffee and sugar canisters. A black and red 2100W upright vacuum cleaner.